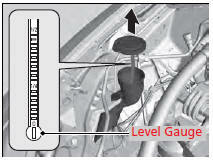 Do not use engine antifreeze or a vinegar/water solution in the windshield washer reservoir. Antifreeze can damage your vehicle's paint. A vinegar/water solution can damage the windshield washer pump.